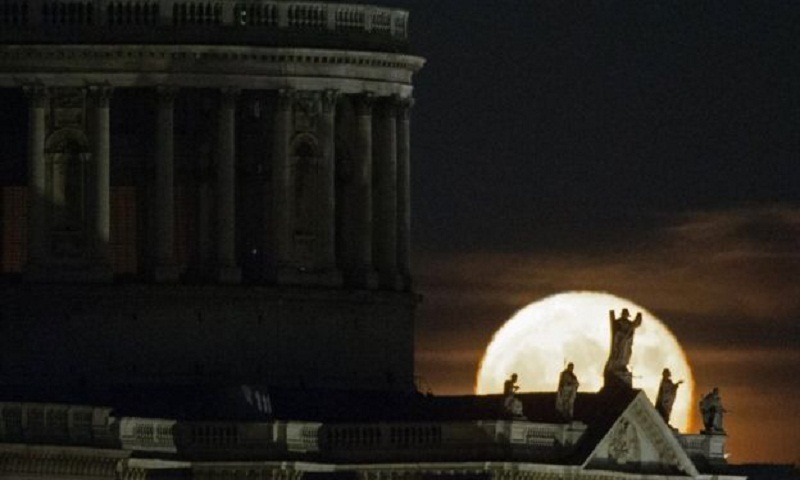 Skywatchers could catch a glimpse of a so-called "supermoon" - when the Moon appears larger and brighter in the sky as it moves closer to Earth - later. It will appear about 7% larger and 15% brighter, although the difference is barely noticeable to the human eye. The exact moment of the full moon will be at 15:47 GMT. Robert Massey, of the Royal Astronomical Society, said it will appear brightest at midnight - when at its highest point above the horizon. The Met Office's UK forecast suggests there will be clear spells this afternoon, so the supermoon may be visible. Last year the Moon made its closest approach to Earth since 1948 - it won't be that close again until 25 November 2034. Nasa has called this weekend's sighting the first in a "supermoon trilogy" over the next two months, with others to come on 1 January and 31 January. December's full moon is traditionally known as the cold moon. This full moon on Sunday afternoon - when it sits opposite the sun in the sky - will be 222,761 miles from Earth, closer than its average 238,900 miles. In the UK, the moonrise will start just after 16:00 GMT - in Edinburgh it will rise at 16:15; in London at 16:21 and in Cardiff at 16:33. The moon doesn't move around Earth in a circle - it orbits in an elliptical or oval shape, reports BBC.